When I was pregnant with our son, over three years ago, we decided to buy a transitional bed: one that starts as a crib, then transitions into a toddler bed, then transitions to a full bed. For the most part, it's been a good decision. It would have been better if we had put the bite guard on the crib before we realized that our son has started nibbling on the rail, but we'll just call that patina. We made the splurge to buy the matching armoire and dresser, but chose not to buy the night stand. About two years later, we realized that we would need one and kicked ourselves when we learned that our set has been discontinued. We looked in all the regular places and couldn't find one anywhere. When we moved into the new house, our best option was to repurpose a little cabinet we had previously used in our media room. I'm not sure when I picked up this cabinet, but I used it as a night stand in my townhouse, before I was married, so I'd say I've had at least eight years, and I'm sure I bought it used. It's well used. And the stain matches nothing in our house. See how I hide it from view in D's new room? Since we've started to get D's room decorated, I decided it was time to bust out the spray paint. Full disclosure: I will never be a professional tagger. I need a community ed glass in spray painting, but I'm pretty sure cities don't prefer to offer that knowledge. So I'm left on my own. Last look at the orange-y night stand. First coat of the primer. I used Rustoleum Ultra Cover 2x Primer. I bought it at Walmart, and I'm not sure why I bought the red primer when the black probably would have been a better choice. I'm glad I started on the back because I immediately made a nice streak of drips. I'm thinking a steady back and forth motion makes for a smoother application. I was happy with how quickly it dried--about fifteen minutes. 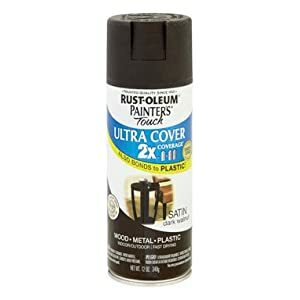 Next, I applied Rustoleum Ultra Cover in Satin Dark Walnut. I had originally bought another color, but my hubby wisely suggested that the dark walnut would be a better match for espresso. (Note to self: return other can). The paint was just dry when our son woke up from his nap and, rather than admiring my work, asked why his night stand couldn't stay orange...or be yellow. (He loves yellow). The other thing I wanted to change was the wooden knobs. The rest of his furniture has silver accents, so I was able to use two extra silver knobs I had from another project. The knobs are Target Home Scoop knobs in Satin Nickel. D has adjusted to his matching furniture and the night stand is now overflowing with books again (he is my son, after all! ), but here's a photo of the finished produce in a messy post-nap toddler room.